Jacquard recommend stove-top dyeing with the Polyester dyes. Use a large receptacle on the hob (eg a jam preserving pan), add the item along with the dye and vinegar - and a colour intensifier which is included. 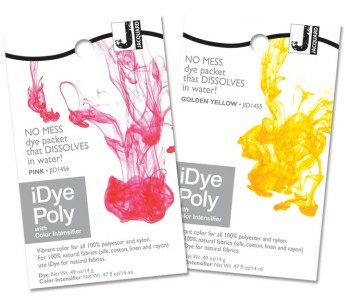 iDye Poly now comes in 16 colours and works on polyester, nylon and even some plastics! Use iDye Poly to colour discs or Frisbees, RC car components, 3D printed objects, action figures, mobile phone cases, polycarbonate plastic objects and more. Use it to dye blended fabrics or to colour just the polyester threads in your garment. iDye Poly may also be used for sublimation transfer printing, thickening the dye mixed with water, then painting onto paper and transferring onto fabric. For polyester/natural blends use with a sachet of iDye for naturals in a matching colour. Each pack will dye 2-3 lbs fabric.